Smaller than the other similar one on the site. 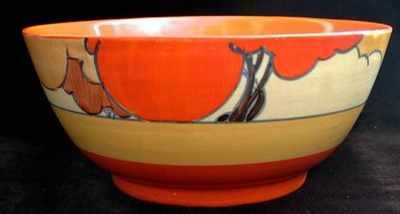 This Bowl in the Orange Autumn pattern is 7 inches wide. No damage or restoration. Minor factory flaw to rim. Excellent paintwork. Backstamp is Bizarre by Clarice Cliff.